This is a little different but is such a unique idea. 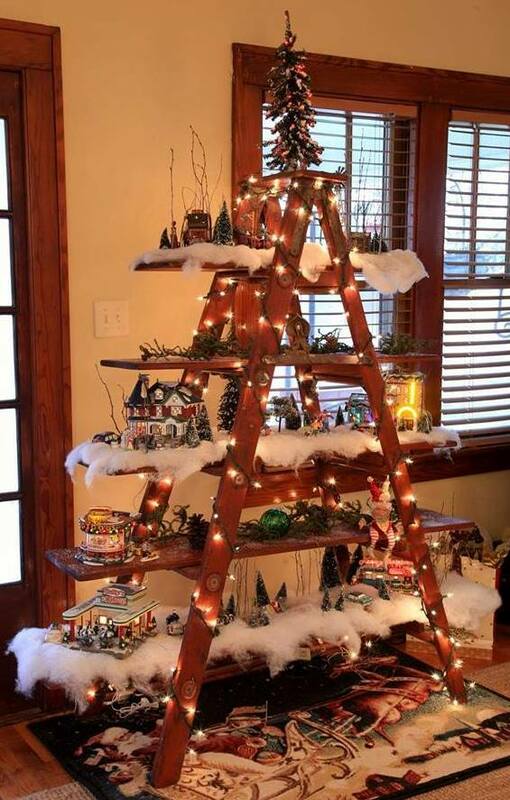 For those with limited space you can create a space to display your Christmas village scene, nutcrackers, music boxes, etc. A simple old ladder will do to give a nice rustic look or use a wooden ladder and paint it to sit your design. Wood planks were cut to width to fit between legs of ladder to rest on foot steps of ladder. Here they covered with lights and lined each shelf with white ‘snow’ to create a village scene. Kristin and Paul submitted their great design – guys it turned out really nice – so glad you are continuing to display and collect what was passed on to you. It makes it that much more special! This entry was posted in Crafts ~ DIY ~ Projects, ~Christmas. Bookmark the permalink.